Mako plays Father Christmas in "Bus Story." So often these days, courage is defined as taking on something big, usually an opponent or adversity, and trying to overcome. It's Lance Armstrong beating cancer and winning the Tour de France, or U.S. soldiers risking their lives in Iraq. And while it's true that these are some of the finest instances of courage, they are also grandiose in scale, when sometimes employing courage is a lot quieter and more personal. Filmmakers Donna Choo and Simone Ling explore this concept of courage in their 11-minute short film "Bus Story," which is making its isle debut Saturday at the Hawaii International Film Festival. The film, a telling of two love stories, presents protagonists who make an unlikely but deep connection on a bus ride. Will the couple be courageous enough to follow their hearts? Or will the fear of breaking with convention be too great to overcome? Facing one's fears is something that director Choo, a Hawaii-born woman now living in Los Angeles, is well acquainted with. "Bus Story" is the fulfillment of a personal dream to "make a movie someday." "I had to try," she says. "I couldn't live my life asking, 'I wonder what would have happened ...' My fear is having regrets." CHOO STUDIED FILM at the University of Southern California in the mid-'90s and "had loved films, unknowingly, all my life." "I watched 'Singing in the Rain' dozens of times since I was a child, and I used to play trivia games with my brother to see who knew more about the movie," she says. During her last semester at USC, Choo landed a job at Sony Pictures as a story editor. Story editors write "book reports" about any "script, book, tape, magazine article -- anything that's a possible story idea for a movie." Choo calls her time at Sony "incredible" mostly because her stint overlapped with local boy Chris Lee's reign as head of the studio. "He happened to be Asian American and from Hawaii. I have great respect for what he did in Hollywood." But after seven years of reading other people's stories, Choo thought, "Why on earth aren't I giving it a shot?" So she gave up her regular gig to carry out her longtime dream. ORIGINALLY, "Bus Story" was intended as a project at Seraphim Films, horror writer Clive Barker's company. Seraphim had an idea to package a number of short films by first-time writers/directors to sell to an independent film channel. But as is often the case in Hollywood, funding for the project still hadn't come through two years later. Choo decided she didn't want to wait any longer to have the film made, and so she and Ling financed it themselves. "In Los Angeles it's not unheard of for people to self-finance short films," she says. In Choo's case, the education and connections from her time at Sony paid off. In many cases, friends in the business provided equipment and services free of charge. "I got my equipment piggybacked on Kevin Costner's movie 'Dragonfly.' It saved a few thousand dollars -- nothing to the studio but a fortune to me," she says. Choo was also able to use the bus from the hit movie "Speed," thanks to a friend who gained her access to a movie vehicle lot. No one on the cast and crew got paid for doing "Bus Story," either. Choo says such generosity is what she most enjoys about the independent film community. "I passed the script around and people started calling. Simone and I did a tremendous amount of favors for other people, and I was touched when everyone came out for us. The atmosphere of the indie film world is that people will do for you if you just ask." 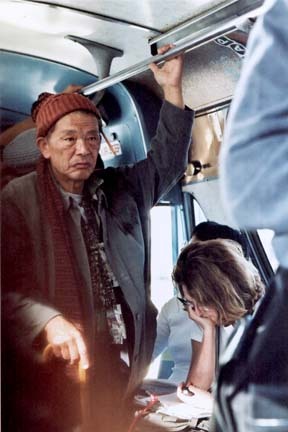 ONE OF CHOO'S favorite stories about making "Bus Story" is how she and Ling were able to cast Mako, whom Choo refers to as "an elder statesman of Asian-American actors," as a homeless man in the film. "I had an idea that we should cast against type for an interracial homeless couple," she says. "I told Simone, 'I want someone like Mako.' And she said, 'Don't get someone like Mako. Get Mako. Go ask.'" So Choo cold-called him. "That's the great thing about starting from nothing," she says. "You've got nothing to lose." Mako agreed to meet Choo at a Starbucks after he read the script. The novice director and veteran actor "chatted about everything -- Japan, his film career, Hawaii (he loves Hawaii) -- except the movie. "Finally, he said, 'Well, Donna, we'll see. I'll get back to you in a few days. And I thought, 'I did it. Even if he says no, I did it,'" she recalls. When Mako agreed to do "Bus Story," Choo says she was "amazed." "This established actor said yes to me, who never directed a frame before. But from start to finish, he was the most professional person. Always on time, did everything I asked. He was so respectful that this was my movie, yet he taught me so much just by my directing him." Choo says Mako's character was described as wearing a toothless grin. That first day at Starbucks, Mako took out his front false teeth and smiled at her. "How's that, Donna?" he joked. "There's no vanity; for him, it's all about the art," she says. PRODUCER LING, Choo's partner in getting "Bus Story" made, sounds like the producer from heaven. "Simone gets more than 50 percent credit for this," Choo says earnestly. "She took care of all the money, drove people around, picked up food, parked cars, everything. She was so completely on top of everything. It's her belief, faith and passion that saw us through. She has that 'go for broke,' 'never say die' attitude. She's the one who said, 'Don't get someone like Mako. Go get Mako.' You need gumption like that to succeed." AFTER ALL that work, which spanned a year from start to finish, can Choo and Ling be included in the ranks of those labeled "courageous"? "When they called for the director on the set on the first day of filming, my heart sank and I thought, 'What have I done?' I was petrified," Choo says. "Then Simone came over and told me something Eleanor Roosevelt had said, that every day we must do something to overcome fear. Every single day. "You know, it's a measure of insanity to make a movie. You have to be crazy enough to think you can do it and then insane enough to keep going." Insanity or courage? "Bus Story" probably required a good helping of both.